Arrive by Emirate Air -EK544 at Chennai International Airport by 08:10 AM, where the representative of PTT will assist you in the transport to Hotel Trident Chennai. Check-in will be at 13.00 to allow for relaxation time. In the afternoon, there will be a half-day guided tour of Chennai to visit the following locations: St. Thomas Cathedral, Fort Museum, Marina Beach, Kapaleshwar temple, and Kalakshetra Cultural Village to watch the traditional dance of Tamilnadu Bharatnatyam. Overnight stay at a hotel. After breakfast, we leave for Pond cherry and stop on the way at Mahabalipuram (An UNESCO World Heritage Site). There, we will have a guided tour of Mamallapuram, including the Caves, Krishna Mandapam, Five Rathas, Shore temple and Arjuna’s Penance. It is the perfect place to see the ancient Pallava architecture in South India. 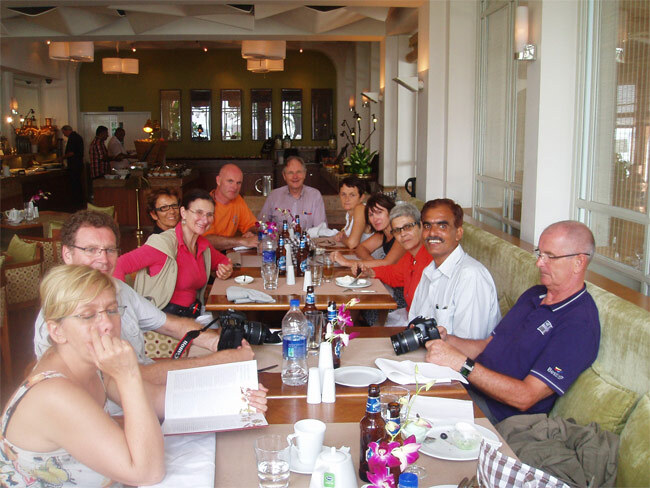 Arrive at Pondicherry and check in at the Hotel De L’Orient, Overnight stay at the hotel. Pondicherry is one of the finest attractions of India. It is also called the French Colony. Today, our guide will take us to visit the Aurobindo Ashram, which is the major tourist attraction of Pondicherry. Sri Aurobindo Ghose, a noted freedom fighter, philosopher, and poet, founded this Ashram in 1926. The other sightseeing points in Pondicherry are Auroville, Promenade, the temples, Botanical Garden and the Museum. Overnight stay at the hotel. After having breakfast, we will leave Pondicherry for Thanjavur, stopping at Chidambaram to visit Nataraja temple, Annamalai University, and Kali temple. We will arrive at Thanjavur and check in at Hotel Parisutham. In the evening, we will take a tour of the Shri Brahadeeswarar temple (An UNESCO World Heritage Site) as the atmosphere will be superb at this time. Overnight stay at the hotel. Have breakfast and see a few prominent temples of Thanjavur with Guide, where the architecture of Chola Kingdom once thrived. The main attraction of Tanjore is Sri Brahadeeswarar Temple – a one thousand-year-old temple. In the afternoon, we continue our journey to Madurai via Tiruchirappalli. “Trichy” tour of Rock fort located on Kaveri River’s bank, which is one of the oldest monuments in the world at approximately 3800 million years old. Visit Srirangam and Tiruvanaikkaval temples as well. Arrive at Madurai to check in to the hotels, Overnight stay at Fortune Pandiyan Hotel. After breakfast, we will leave for Periyar National Park (Thekkady) via a picturesque route. Arrive at Periyar check-in to the Hotel Shalimar Spice Garden. Meals Included: Breakfast at Fortune Pandiyan, lunch & dinner at Shalimar Spice Garden. In the morning, take a boat ride over Lake Periyar to see the rich wildlife. Periyar Tiger Reserve or Periyar National Park is spread in an area of 777 square KMS. It is a quite rich, diverse deciduous jungle, combined with the open area of the tall grass. The Lake Periyar is a man-made, fabulous lake scattered with dull wood’s snags, water birds, grey heron, darter, kingfisher, and egret. Periyar is one of the best places to see the wild Asiatic elephants. The huge mammals out here swim over the lake and the streams, and normally these animals may be spotted while taking the boat ride at Lake Periyar. It is also the home of Royal Bengali Tigers, leopards, wild dogs, Sambhar, Barking deer, macaque with lion tail and Nilgiri Langur. Periyar Tiger Reserve has the various species of woodland birds. The boat is the only available mode of transport at Periyar National Park. After breakfast, you will travel to Kumarakom (180 K.M-4h). On arrival, you will be transferred to the boat jetty at Kumarakom to embark the awaiting 22Hrs luxury houseboat backwater overnight cruise to experience the fabulous Kerala backwaters. A houseboat is also known as a ‘Kettuvellam’, which is a traditional Kerala houseboat that travels Vembanad Lake’s narrow channels, the lush green paddy fields, and the tiny local villages to witness the rural life of Kerala. Overnight stay on the houseboat. Meals Included: Breakfast at Shalimar Spice Garden, lunch & Dinner on Hose boat. We will finish the backwater cruise at Alleppey jetty. Disembark the houseboat after breakfast. Later, we will transfer to Varkala, Arrive at Varkala, check in to the Taj Garden Retreat The rest of the day will be free to admire the beautiful views, swim in the large swimming pool, relax in the Ayurvedic massage parlor. Overnight stay at the hotel. A leisurely day. Walk around on cliff, rest, and relaxation on the beach. After breakfast, leave for Cochin. Arrive at Cochin and check in to the hotel. Cochin is a commercial capital and gateway of Kerala. It is also one of the best harbors of the world. Arrive at Kochi. Check-in to the Trident, Cochin Overnight stay at the hotel. Meals Included: Breakfast at Taj Garden Retreat, Lunch & Dinner at Trident Hotel. After breakfast, start a daylong sightseeing tour with guide of Fort Kochi including Dutch Palace - this palace was constructed in 1555 AD by the Portuguese rulers and offered to the King of Kochi. The 17th-century murals portray scenes from the Ramayana, an epic of India. We will tour the St. Francis Cathedral, which was originally built in 1510 AD by the Portuguese. It is considered the first church made in India by the Europeans, where Vasco Da Gama was originally buried. Later, we will visit the Chinese fishing nets, which may be viewed from the entrance of the Cochin harbor. The techniques of catching the fish were passed down by Chinese fishermen. Along with the backwater, these Chinese nets are a charming sight. Take a short tour of Jewish Synagogue. The floor of the synagogue is cemented with exquisite Chinese hand painted tiles. Overnight stay at the hotel. Meals Included: Breakfast at Trident Lunch at Taj Residency & Dinner at Trident Hotel. Early morning 06.00 A.M- transfer from Hotel to Kochi International airport for your return flight to Paris. Depart Kochi by Emirates at 09.30. Arrive in Paris at 19.30. Meals Included: Breakfast at Trident. 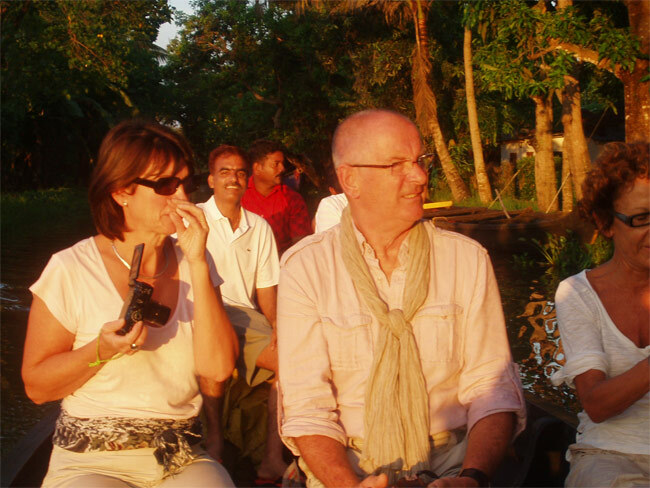 Have a safe and pleasant journey back to France with great memories of your trip throughout Southern India.